...the event fell short of the 20,000 supporters the campaign had forecast as organizers moved people from seats to the arena floor in front of the dais to project fullness to television audiences. Obama volunteers had worked feverishly over the last week to gin up a crowd, making multiple calls to residents believed to be supportive of the president. 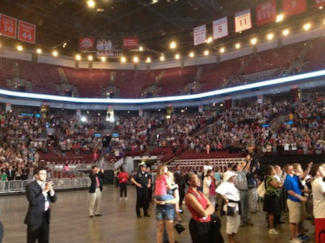 Twitter was abuzz with photos and comments about vast areas of empty seats in the arena's upper deck. One such photo is below. Obama's first-term celebrity status and the excitement with which it was accompanied has vanished. He will thus be forced to rely upon his record in order to compensate for the loss of enthusiasm among his erstwhile constituency. That effort was not helped by Friday's news that the "portion of Americans in the work force is at its lowest percentage since 1981." Coincidentally, 1981 would be the year that Carter conceded defeat after a single term in office to Ronald Reagan.The Obama-Carter parallels continue to arise. The Obama campaign's efforts to divide the nation and distract voters from the economy have thus far fizzled and failed. Such attempts have proved uninspiring and ripe for mockery, such as the ridiculous claim that Romney would not have killed Bin Laden, parading out a government-dependent, ward-of-the-state power-point character named Julia as the latest evidence of a "war against women" and declaring the campaign motto to be the socialist-styled, "Forward" (to which Romney promptly replied, "What, off the cliff?). Obama's campaign is off to a rough start. Voter disappointment in his weak record of accomplishments and America's continuing economic slump weigh against Obama's favor. As Ohio reveals, the election is practically tied at the moment (an unenviable situation for the incumbent candidate) and Obama faces a strong head-wind.